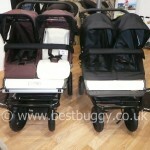 Here are some comparison pictures for the new Mountain Buggy Duet v’s the Duo. 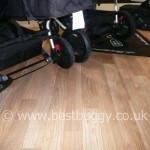 The photographs taken by Best Buggy were taken at the Harrogate Show earlier in 2011, and show the prototype Duet. Please be aware that there are differences in the fold and footplate in the version of the Duet that is about to go on sale to customers. As soon as we have the new Duet, we hope to update our photos. 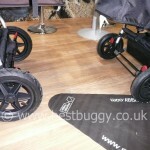 They are here purely to help understand the size difference, as shown in the official Mountain Buggy picture with the silhouette of the Duo behind the Duet, rather than the detail! Easy to remove fabric which wipes clean! 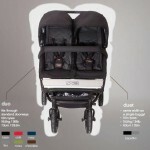 There are some accessories specific to the Duet including carrycots, storm cover and sun cover. 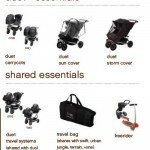 There are some accessories suitable for both the Duet and Duo including the travel bag, car seat adaptors and Freerider. 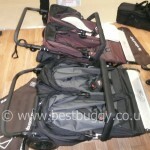 Mountain Buggy Duet - The First Week! Mountain Buggy Duet - Hole in the Hood!! Mountain Buggy Duet in Car Boots!